At Allvech our aim is simple, to provide professional car and vehicle services, and, to assist you in solving your car and vehicle issues quickly and effectively ensuring minimum impact on your day-to-day plans. From a mobile mechanic or tyre replacement to a full fleet check you can be safe in the knowledge that all of our fully trained professional mechanics are at hand to best advise you and get the job done right, complying the highest standards at all times. We are recognised for total excellence in terms of service, not just as a commercial and domestic vehicle services, but also for our emergency service. 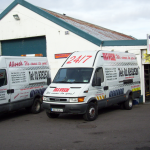 Providers of an award winning high quality 24-hour vehicle service, working across Dublin and Meath. For those who can’t get to a garage. Allvech’s motto is simple but it makes us unique. We operate a fleet of fully stocked mobile service units that will visit your home, place of work or even roadside to repair your vehicle. Our mechanics are highly experienced, friendly and efficient. Lads in Allvech where our savour!